02/28/17: -	Guest Lecturer Introduction to Spacecraft Structures, Lecture to Univ of Colorado Aerospace Freshmen Class "Gateway to Space"
12/22/16-12/23/16: -	Guest Lecturer Relating Earth Science to Planetary Science and the Search for ExoPlanets, Lecture to 9 independent Freshman-level Earth Science Classes, also Guest Lecturer How Archimedes and Newton created Calculus and how these basic principles are used by NASA, Lecture to 1 calculus class and 2 independent pre-calculus classes, Henninger High School, Syracuse, New York. 10/12/16: -	Guest Lecturer Incorporating High Strain Composites into Spacecraft Structures, Lecture to Univ of Colorado graduate student body, Boulder, Colorado. 10/04/16: -	Guest Lecturer Introduction to Spacecraft Structures, Lecture to Univ of Colorado Aerospace Freshmen Class "Gateway to Space" Boulder, Colorado. 02/25/16: -	Guest Lecturer Introduction to Spacecraft Structures, Lecture to Univ of Colorado Aerospace Freshmen Class "Gateway to Space" Boulder, Colorado. 10/06/15: -	Guest Lecturer Introduction to Spacecraft Structures, Lecture to Univ of Colorado Aerospace Freshmen Class "Gateway to Space" Boulder, Colorado. 05/15/15: -	Guest Lecturer Tectonic Activity on Earth and Neighboring Planets, Lecture to Freshman-level Earth Science Class, Henninger High School, Syracuse, New York. 04/18/15: -	Judge Colorado Undergraduate Space Research Symposium, Colorado Space Grant Consortium, Boulder, Colorado. 04/14/15: -	Guest Lecturer Utilizing Materials Science to Design Exotic Space Structures, Lecture to Univ of Colorado Aerospace Engineering Freshman, Boulder, Colorado. 02/25/15: -	Guest Lecturer Working for a Small Startup, a perspective, Lecture to Univ of Colorado graduate student body, Boulder, Colorado. 04/29/14: -	Guest Lecturer High Strain Composites and Deployable Structures for Space, Lecture to Univ of Colorado Aerospace Engineering Freshman, Boulder, Colorado. 10/19/12: -	Guest Lecturer "The Sounds of a Rocket", activity to first grade music classes, Inner-city Elementary School, Boston, Massachusetts. 10/18/12: -	WeWantOurFuture Activity presented at Family Space Night, Metz Elementary School, Westminchester, Colorado. 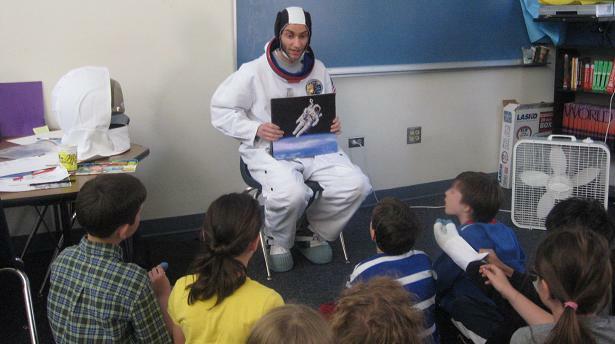 04/25/12: -	Guest Lecturer "Spaceship Earth", Ricks Elementary School, University of Denver, Denver, Colorado. 04/17/12-04/19/11: -	National Space Symposium, Volunteer for the Space Foundation social media team. 10/15/10: -	Organized day-long curriculum for first generation college perspectives through the Gear-Up High School program, based in Greeley West High School, Greeley Colorado. Event took place at the University of Colorado with engineering lecture & activity, having lunch at a campus dormitory and splitting the students into teams to attend one college lecture of their choice. 10/09/10: -	Presented 3 lectures to 11th and 12th grade students at the CU Engineering Sampler. Discussed the structural dynamics of a single-degree-of-freedom system, showed how to calculate natural frequency of the resulting second order differential equation and identified concept of frequency response plots. Theory was demonstrated by experimentally determining the frequency response of a slender beam using accelerometers and Labview software. 10/08/10: -	Presented to five 4th grade classrooms at Superior Elementary School in Superior, CO. Lecture discussed overview of structural dynamics the concept of a natural frequency and design methods. I demonstrated these concepts with a mini vibration table to show the response of a mass-spring system and mode shapes of an elastic string. 09/25/10: -	Volunteered at the Boulder History Museum, Boulder CO during the opening of the Celebrating 100 Years of Flight in Colorado exhibit. Spoke with elementary school students and performed the WeWantOurFuture.org postcard activity. 08/27/10: -	Presented to three 4th grade classrooms at Firestone Elementary School in Superior, CO. Lecture discussed overview of structural dynamics the concept of a natural frequency and design methods. I demonstrated these concepts with a mini vibration table to show the response of a mass-spring system and mode shapes of an elastic string. 04/26/10: -	High Peaks Elementary School, We Want Our Future Activity to 6th graders. 04/10/10: -	Yuri's Night Community Celebration, Boulder - On the organizing committee. 03/15/10: -	Ricks Elementary School, University of Denver, Denver CO. Performed the We Want Our Future activity for a kindergarten class. 05/26/09: -	Organized day of curriculum for first generation college perspectives through the Gear-Up High School program, based in Greeley West High School. Event took place at the Univ of Colorado with engineering lecture, meeting with campus admissions counselor, tour of campus, reaction center visit and on campus lunch. 07/27/08-07/30/08: -	High School Honors Institute, Camp Counselor for three days. 06/03/08: -	Organized day of curriculum for first generation college perspectives through the Gear-Up High School program, based in Greeley West High School. Event took place at the Univ of Colorado with egg drop, lunch at a college dorm, meeting with admissions counselor. 05/08/08: -	Microgravity Outreach Event, Greeley West High School, Greeley CO, 250+ students in auditorium. 11/19/07: -	Presented a lecture on Hazards of the Space Environment to the Fayetteville-Manlius High School in Manlius N.Y. hosted by the science department. 04/26/07: -	Discussion with 7th graders on campus with the Lunar Module Mockup. A 4th grade student perspective of Bruce’s presentation on structures and vibrations.